"Fire was a symbol of power and a means of survival. The tribe who possessed fire, possessed life." When cavemen appear in the movies, they're often either woefully anachronistic and ridiculous (One Million B.C) or intentionally played for laughs (Caveman). Seldom are they taken seriously, as they were in 2001: A Space Odyssey. But French director Jean-Jacques Annaud, with the help of some eminent authors and linguists, provides for us a faithful look at what life might have been like for our primitive forebears at a date 80,000 years ago. 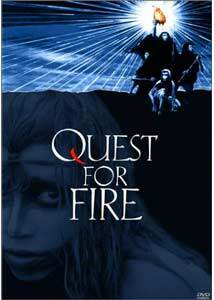 Quest for Fire centers on the Ulam tribe, which has progressed to the point of rudimentary language skills and use of simple tools. The Ulam are still unable to create fire and are dependent upon nature to provide flame, which they then maintain and nurse. When they are driven from their home and fire by the Neanderthal Wagabous, their carefully shepherded flame goes out and three of their number, Naoh (Everett McGill), Amoukar (Ron Perlman in his first screen role) and Gaw (Nameer El-Hadi) are sent to find a new fire before the tribe freezes to death in the bog where it has taken refuge. Their quest takes them among the cannibalistic Kzamm, where they rescue a young woman, Ika (Rae Dawn Chong), from the more advanced Ivaka people. Along the way they also meet woolly mammoths, and learn about the arts of fire, love and domestication of animals. Although it isn't per se implausible that different stages of human evolution might have co-existed at once, the fact that four distinct species (distinguished by not only their skills and tools, but their lack of body hair) are here present in a quite small area makes for a bit of a stretch. It does help with the storytelling, however, as it makes distinguishing these groups on sight easy and permits audience concentration on the unfolding tale instead. Anthony Burgess (author of A Clockwork Orange) developed the language of the Ulam people, and excerpts from his dictionary are included in the extras. Not a word of English or any other modern Western language is uttered (though as the commentary reveals, the Ivaka people were dubbed by Inuits after the production ran out of both time and money). The result, without translating subtitles of any kind, depends upon immersion to give the viewer a participatory sensation, since one must derive meanings solely from context. This simple but profound conceit helps keep the picture on a serious and involving level where it might have devolved into unintentional comedy. Although Rae Dawn Chong got most of the notoriety at the time of original release, mostly for spending nearly her entire screen time naked, the real star here is Everett McGill. He would go on to portray Big Ed in Twin Peaks, and the tormented antihero of Iguana. In the review of the latter, I made reference to McGill's limited acting skills, but I find here that his skills were far more formidable than I understood. He uses his eyes and pantomime to create an utterly believable picture of a creature somewhere between man and ape, with brutish qualities yet a spark of humanity inside, often communicated in purely visual terms. Chong is also good in her debut, though she's hampered a bit by some unfortunate makeup choices that cause most of her face to vanish. Ron Perlman also impresses and convincingly depicts an Ulam just an intellectual notch beneath Naoh. Although the synopsis might not sound like compelling storytelling, this is in fact highly watchable and rewatchable. The picture is beautifully shot (on location in Scotland, Kenya and Canada) and provides some extraordinary visuals to go with the involving tale. And don't forget to invite your Inuit friends to watch! Image Transfer Review: The anamorphic widescreen picture is very attractive. Resolution is excellent, with good textures and detail. Color is decent, though only in the sunsets and vegetation is there much of a color palette present. Shadow detail is well-rendered, and the black levels are reasonably good. Audio Transfer Review: The sole audio track is a 5.1 mix. That seems to be overkill, with directionality and significant bass present only during the sequences with the woolly mammoths. Hiss and noise are kept at quite low levels and are not distracting. Dialogue is crisp and has decent presence, while the musical score is full and rich. Very little to complain about here. Extras Review: Fox pulls out all the stops for a single-disc special edition. A commentary featuring Chong and Perlman, together with producer Michael Gruskoff, is entertaining (though they spend a fair amount of time bickering about the facts of various stories related). There's not much dead time or repetition, and it's certainly worthwhile. Director Annaud contributes his own track and has a number of hilarious tales related to the difficulty of making this film. But he's not done there; there are also 15 galleries of stills, art, behind-the-scenes photos, notes from the director and storyboards, all of which also bear his audio commentary. Though his French accent is a bit thick, he's nonetheless readily understandable. Alas, there is no "play all" button for the galleries, so you will need to keep the remote control close at hand. Orson Welles hosts a "making of" documentary from the time of release (22m:51s), which provides a good deal of behind-the-scenes footage, though the excerpts of the finished picture generally look rather poor. Wrapping up the package is an anamorphic trailer. Subtitles are provided nominally in three different languages, though they only transcribe the caveman words and very properly don't translate them for the viewer. This is a great disc, with a first-rate primeval fantasy, a huge amount of extras for a single disc, and a very nice transfer to boot. Recommended.